Puff pastries are a distinct type of pastry that features layers of butter-covered dough rolled and folded over each other. Puff pastries are so named because they puff up when baked. They are not ideal for optimal health or weight loss diets, as they are high in calories and fat. 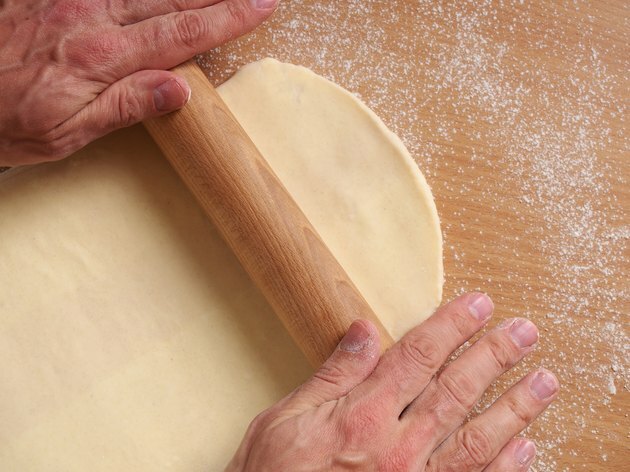 Puff pastry is a calorie-dense food, as 1 oz. of it contains 158 calories. That amount composes about 8 percent of the daily recommended intake of 2,000 calories and is more than what other baked goods provide; a 1-oz. serving of wheat bread contains 55 calories. Puff pastry is high in fat. Each 1-oz. serving of puff pastry contains 11 g of total fat. Of this, only 2 g comes from saturated fat, which can increase your risk of high cholesterol. The American Heart Association recommends limiting daily saturated fat intake to less than 16 g, as high cholesterol levels can increase your risk of heart disease. As with other types of baked goods, puff pastry is high in carbohydrates. Each 1-oz. serving contains 13 g of carbohydrates, which are your body's primary source of energy. Unfortunately, none of the carbohydrates in puff pastry contain fiber, which helps promote satiety, regulate blood sugar levels and protect digestive health. Puff pastry is not a good source of protein. Each 1-oz. serving of this pastry contains just 2 g of this nutrient, which is 1/4 of what a cup of milk contains. Protein supplies your body with amino acids, the building blocks of cells and tissues. Puff pastries are not a good source of vitamins and minerals. Each 1-oz. serving contains 4 percent of the daily recommended intake of iron, but puff pastry is not a good source of other such nutrients.